Music in Practice is excited to launch Our Grand Practice Adventure. I do hope that you will be coming with us on the practice adventure of a lifetime. Our Grand Practice Adventure is much more than a boring old 100 day practice challenge. In the past, I did several of these challenges with my children and with my students. These certainly were challenges, but all that happened was that we repeated our bad practice habits every day till they became ingrained. My personal challenge has been turn a a 100 day practice challenge into a grand practice adventure – to create a wonderful opportunity to help our children to let go of limitations and to enjoy working towards their true potential. 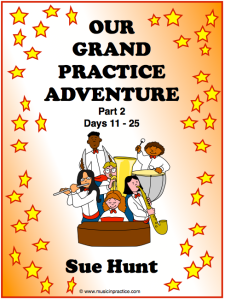 Our Grand Practice Adventure is the result of years of thought and experience. 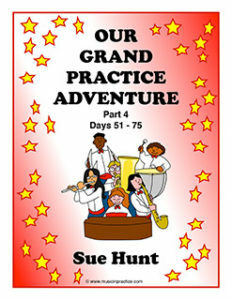 When you come with me, on Our Grand Practice Adventure, you will learn how to make practice happy, focussed daily event. Why, you may even hear your child actually asking to practice! “A journey of 10,000 miles begins with a single step.” Lao Tzu You can come with us for 10, 25, 50, 75 or a whole 100 days. 10 days is a doable first step. Reaching 25 is an easy add on and before you know it, you will reach your goal of 100 days and sail straight on to 200+. ✓ I will share some valuable practice secrets which many of us teachers haven’t got the time to teach in a lesson. 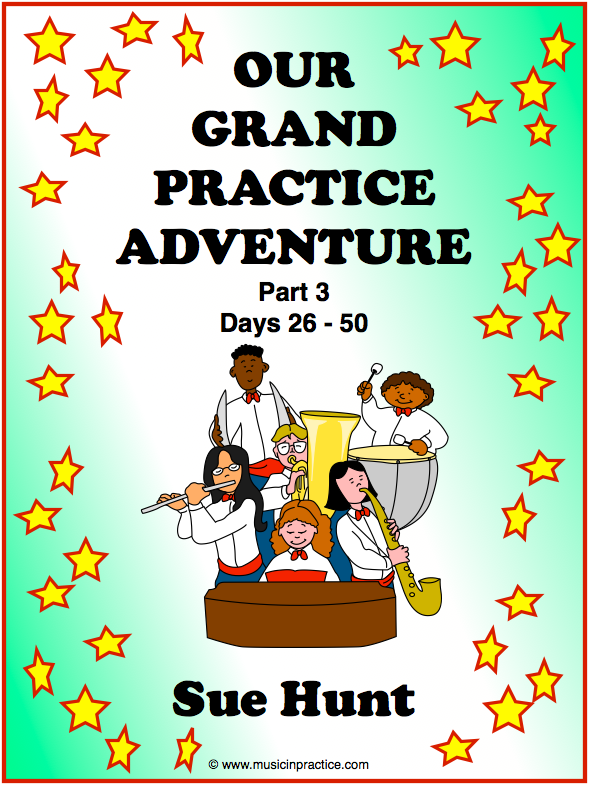 ✓ You will discover the best practice strategies to help you and your child to enjoy practice. ✓ Practice scheduling tips will help you to fit stress free practice into your busy life. ✓ Find out what all parents need to know about children’s practice assignments. ✓ There’s a choice of 10 day practice charts. ✓ You will love the 10 Day Celebration with invitations and a certificate. ✓ Game of the week. We use games to practise dropping into a state of deep focus! Everyone enjoys practice, when they are having fun. ✓ A daily opportunity to record how things are going. This will help you to become a fabulous, child friendly practice assistant. ✓ Practice Insurance. My secret way of dealing with a full on emergency. ✓ Private Facebook group for mutual support and to post your successes. I’m looking forward to our journey together!